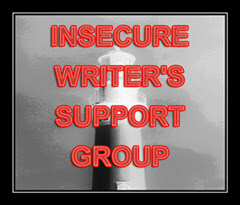 It’s the first Wednesday of the month and, therefore, is time for an Insecure Writers Support Group post. This is my first time participating but I really like the idea. All writers have moments of insecurity, some greater than others, and this is a way to share those insecurities. It is also a way to lend support to other writers. I am no exception when it comes to insecurities and doubts. I actually sent a flash fiction story into a contest recently and it was rejected. Rejection can set me back a bit. It makes me not want to even look at the words I am putting out. I have a really bad tendency of not editing my stuff so I have thousands and thousands of words in raw form just lying around. Well, they are actually stored on flash drives but the concept is the same. Writing for me is necessary. I journal every day. Set challenges for myself either on my own or with a group. I get up early each morning to give myself this gift. If I keep it in this realm, then I am okay. Where I am not okay and where the insecurities come in is when I look at my work to edit and then send out. I look at a piece of writing I’ve done, thinking at the time of the writing that it isn’t too bad, and realize after a cooling off period that it is awful. I believe there is little redemption in the piece and I put it back down not even attempting to complete any editing or revision. I also realize this is no way to achieve my goal. I often wonder if I can actually do this. Can I actually be a published writer? Hemingway is credited with saying something like it takes 1 million words to learn your craft. For me, any words that show up before that million word mark aren’t any good yet. I have a long way to go. Some days are good. Those are the days that the words flow and I can see what I am aiming for with my words. Other days I wonder why I bother to stumble out of bed to show up for the muse. I do this every day because I love it. Though I would love to be published, I don’t believe I can function in my life without writing. It has become necessary to me. I work at dealing with the insecurities and just keep going. I am glad for the Insecure Writers Support Group because it reminds me that I am not alone in this. We all have our moments but this gives us hope. Welcome to IWSG! I’m one of the co-hosts today. It’s funny that revising was your topic because that’s what I wrote about too. Revising is actually my favorite part now that I’ve given myself permission to write crappy first drafts. Every draft has moments of brilliance, but mostly they are bad. All of them! They’re supposed to be that way. I’ve learned to like revisions because that’s when I fine tune everything. I get to elaborate as well as cut the boring parts. Watching a story take shape and “grow up” is really cool. Give it a try sometime and just enjoy the process. Thanks for the words. I haven’t made over to that side but hopefully that will be my next learning experience. Thanks for stopping by. It does take a lot of words, so don’t be frustrated by all of the practice. Just keep writing and improving! Thank you for stopping by and for the encouraging words.